Police have released some CCTV images of people they want to question over an attack on a doctor in Birmingham. The attack took place between 2.40-3am on Wednesday 30 April as the 37-year-old paediatrician, who works at Birmingham Children’s Hospital, walked in Colmore Row. He was approached by three men who asked him the time, the men then followed him to outside Colmore Gate, before one of then struck him on the back of his head with some unknown weapon. The doctor suffered two deep cuts to his right ear, requiring eight stitches and will suffered permanent scarring. DC Andrew Hiles from Force CID said: "I can only describe this attack as cowardly and unprovoked. The man had been walking back home following an evening out when he was set upon. I am keen to hear from anyone who may have information about the attack or who may have been in the area at the time to contact police on 101 or call Crimestoppers on 0800 555 11." 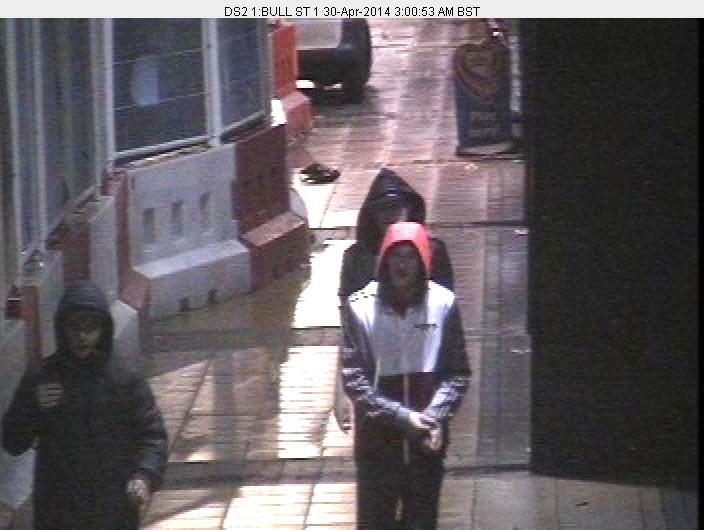 The offenders are described as three men in their twenties, one wore a white or cream jacket with a hood.